NIMBioS Undergrads – Where are They Now? Just a few of the graduate institutions, companies, and scholarships our past REU and SRE students have mentioned so far. 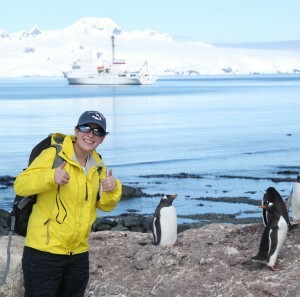 Former SRE Nicole Bender conducts penguin consensus work in Antarctica as a part of her doctoral work at Stony Brook Univ. Their lives once converged here for a summer research experience at NIMBioS, but now our undergraduate alumni study pipets at Stony Brook University, viral evolution at UCLA, and computational ecology at the University of Oregon, among many other experiences. NIMBioS has recently begun to reach out to the alumni of our undergraduate research experience programs, now called the Summer Research Experiences (SRE) program, to find out their post-college graduation plans and endeavors. “I can say that the REU experience has greatly contributed to a successful application and start at the University of Oxford,” wrote 2012 REU alumna Annet Westhoek, who is currently pursuing her PhD in Systems Biology at the University of Oxford where she models the interactions between legumes and their nitrogen-fixing symbionts. With six cohorts of REU/REV/SRE students since 2009 and many long since graduated, catching up with all 115 of them is a considerable challenge. If you are one of our alumni reading this, we want to hear from you! Let us know what you’re up to — whether you are in graduate school, working, backpacking Central America or writing your memoir, please drop a note to Kelly (Moran) Sturner at kmoran@nimbios.org. This entry was posted in careers, Education/Outreach, graduates, research, REU/REV, SRE, undergraduates and tagged careers, Education, Education/Outreach, research, REU/REV, SRE, undergraduates. Bookmark the permalink.